Walking into Fat Panda, there is a cosy and relaxing vibe exuded, making you feel instantly welcome. Greeted by the staff on your way in, you’re invited to sit at either the small sushi train at the back of the restaurant, or at one of the few tables lined up against the wall. Opting for the table, we were presented with the food and drinks menu, and was given ample time to freely browse through it. As we were waiting to order, one can look around at the small yet picturesque restaurant. Alongside the back of the counter are decorations of panda themed objects; toys, drawings, etc. The black themed décor adds class to this place, contrasted with white marble tables and picturesque drawings of birds in chalk on the walls enhancing the sophistication. Keeping up this atmosphere, the staff are friendly, efficient, and well-presented. We ordered fairly quickly, with food coming out just as quick. 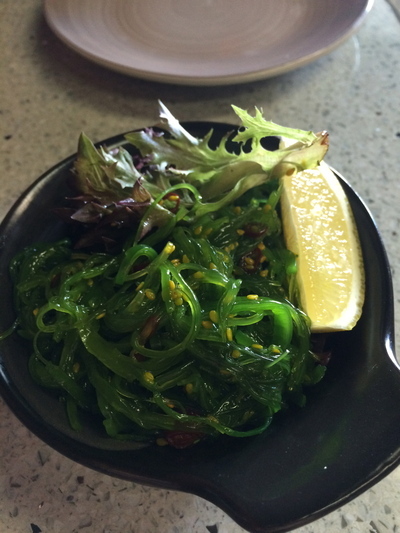 The Seaweed Salad ($7) was first, with seaweed served on mixed greens with lemon as a garnish. There was not a fishy taste to it, and was so fresh and tasty, with the right amount of tanginess to it. 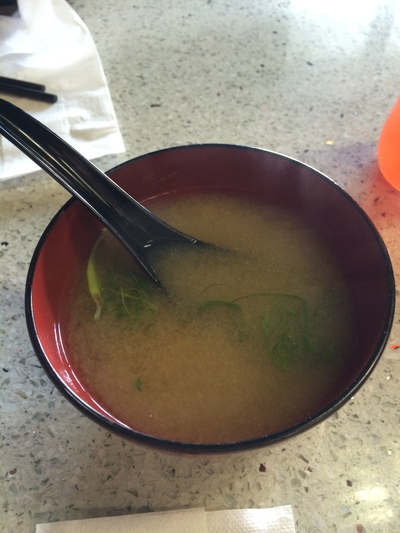 The piping hot Miso Soup ($2) had the right balance, flavour, and water concentration. It wasn’t too salty or watery, and was a delicious and cheap treat to have. Always one to order dumplings, my mum and I opted for the Vegetable Goyza ($7). These pan-fried dumplings were served with soy vinaigrette and shallots. The serving of five was fresh and hot from the kitchen, as well as being lightly fried and delicious. The vegetables inside were cooked well, while the taste of the dressing was a mixture of sweet and sour, meaning that it was the perfect sauce to accompany this dish. While I have been to Fat Panda before, I had never been able to order from the lunch menu as I had always visited outside of the lunch special times (Tues-Fri, 12pm-3pm). However, this time I was fortunate enough to be able to try one of their bento boxes, and ordered the Vegetable Tempura ($10) box. It was served with steamed rice and a green salad. I was initially disappointed that there was no sushi to go with it, as I usually find is something that is included in bento boxes, however, that didn’t matter by the end of it as I became full just on the three components. The vegetable tempura was light, and not too oily, and came with pumpkin, beans and eggplant. 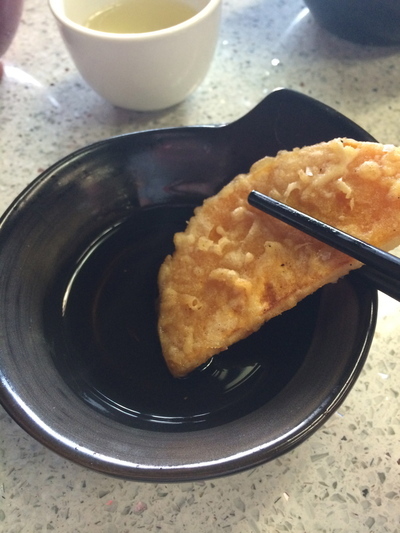 There was a dipping sauce that complemented it, and was tangy and added a great flavour to the tempura. The steamed rice was cooked well, while the salad greens offered something light in between the two slightly heavier components, and had a sharp and flavoursome dressing to go over it. My mum ordered the Yakiniku Beef ($10) bento box, also served with rice and salad. The grilled beef was cooked well and very tender. It was succulent and tasty, and came with a dipping sauce that looked like Teriyaki sauce which did not overwhelm the beef, but served to enhance the already juicy flavours of the beef. For anyone looking for a cheap and filling meal that will leave you just as happy and satisfied by the end of it as we were, Fat Panda is a perfect choice. 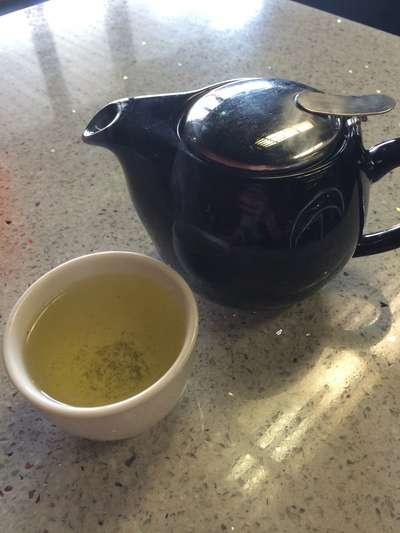 Parking can be a bit of a pain to find, however, it will be worth it to visit Fat Panda for an enjoyable experience in a small, yet cosy and sophisticated restaurant that holds its own against the other myriad of restaurants along Canley Vale Rd. Where: 233 Canley Vale Road Canley Heights NSW. Good for kids: Depending on whether they enjoy Japanese food, as there is no kids menu.